Review & Giveaway: SoftSoap* skin is in™! #Softsoapskinisin #BodyBliss - Frugal Mom Eh! Now that April has arrived it’s time for a little spring cleaning – and I’m not talking about my dusting either. Come spring I always crave a change in the usual hygiene routine and this year I’m doing that with SoftSoap’s 2 unique lines of Body Wash – their Fragrance and Body Butter collections. While I loved each variety I got to try. my top pick has to be the Body Butter Strawberry Scrub. There is nothing I love more at this time of year than the promise of summer and nothing says summer and sunshine like strawberries. This body wash from Softsoap delivers the refreshing scent of a strawberry smoothie. The Strawberry Scrub contains strawberry fruit juice, peach juice, jojoba and coconut oils which make it rich and creamy and really moisturizing. Since it also contains Apricot Seed Powder it also does a great job of removing all that old, dead and dull skin courtesy of the winter weather, allowing the moisture to really soak in. After my shower my skin did not feel dry or tight at all and I was left with the wonderfully fresh scent of strawberries on my skin. Now that is what I call indulgence! From the Fragrance Collection I found myself falling in love with the Citrus Splash & Berry Fusion. This body wash has a truly invigorating fragrance which will awaken your senses as your skin is left feeling soft and smooth thanks to the moisturising formula with a blend of real raspberry, strawberry and peach extracts. This formula also features suspended moisture beads which felt like they were helping the body wash to go on smoothly to re-energise my skin.Have you heard? SoftSoap* skin is in™! Its irresistible fragrances and ultra-rich formulas will transform your shower into an indulgent experience. So go ahead, give your skin the moisture it deserves! Buy it: Save $0.75 on any one (1) Softsoap* brand Body Wash 443 mL – 709 mL with this printable coupon! One Canadian (Including Quebec) Frugal Mom Eh reader will win a Softsoap Gift Basket including all 9 SoftSoap products mentioned in this post. Giveaway ends on April 11th 2013 at 11:59 pm EST. See Giveaway Tools form for entry and for T&C. Disclosure: This post is brought to you by Softsoap. All thoughts and opinions are honest and my own. Check out Bewildered Bug for another chance to win a Softsoap Gift Basket! I would love to try the Sweet Honeysuckle & Orange Peel . Sweet Honeysuckle & Orange Peel – it sounds so fresh! I would love to try the Heavenly Vanilla. heavenly vanilla and the milk protien and honey. they both sound so yummy. but then they all sound good. Would love to try the Citrus Splash & Berry Fusion body wash! I’m most interested in trying out the Juicy Pomegranate and Mango Peel. It sounds like it smells great! I would love to try out the heavenly vanilla. It sounds like it would smell amazing. I love soft soap I have tried the pomegranate and it feels good on the skin and smells great! Thank you for the chance to win. I am most interested in the coconut! I would love to try the juicy pomegrante and melon one! The Black Orchid & Velvet Hibiscus sounds amazing! I would love to try the Pomegranate and Mango! I would love to try Creamy Milk Protein & Honey . I`d like to try the coconut scrub first. I’m interested in trying the coconut scrub. I would love to try any of the Body Butters! Although Heavenly Vanilla and Strawberry Scrub sound wonderful!! I wish to try the Honeysuckle and Orange Peel scent, I believe it would smell really fresh and sweet! strawberry scrub sounds great to try out!!! Ooooooooohhh I’d love to try the coconut one – I love that scent!! I’m most interested in trying Citrus Splash and Berry Fusion!! The Black Orchid and Velvet Hibiscus sounds luscious – I would love to try it! I want to try the black orchid scent! I would love to try Citrus Splash & Berry Fusion! Citrus Splash and Berry Fusion! would love to try the Strawberry scrub. I would love to try the Orchad body wash..
Another vote for Heavenly Vanilla – I love vanilla! Hello, FME. I am most interested in trying the Shea Butter from the Body Butter Collection. Thank you FME and Softsoap for this great giveaway. I’d love to try the Coconut scrub! I want to try the Citrus Splash and Berry Fusion. The SoftSoap Body wash I’m most interested in trying out is their, “Body Butter collection in shea butter”. Thanks. I really want to try the Sweet Honeysuckle & Orange Peel. I love the smell of Honeysuckle bushes on a Summer evening. I’d chose the Body Butter with Shea Butter…. I would love to try the Body Butter Coconut Scrub. Legs…need…it…bad…Yuck! Definitely the Body Butter Strawberry Scrub! I would love to try the citrus splash and berry fusion! I use Softsoap products and have tried quite a few different scents. I think next on my list would be coconut! I’m most interested in trying this one: Black Orchid and Velvet Hibiscus. It sounds so exotic! I’m most interested in the Heavenly Vanilla Body Butter. The chocolate scrub seems amazing. I would love to try the coconut scrub! It could help me get my skin summer ready! Sweet Honeysuckle & Orange Peel! Would love the honeysuckle and orange peel. Honeysuckle flowers have such a gorgeous scent. I would love to try the Sweet Honeysuckle & Orange Peel! The sweet honeysuckle & orange peel body wash.
Sweet Honeysuckle & Orange Peel sounds great! I’d love to try the Coconut Scrub. Would love to win and try the mango scent! I would like to try the coconut scent!! I love coconut, so the coconut scrub would be great! Sweet Honeysuckle & Orange Peel would be my first pick! I want to try the Juicy Pomegranate & Mango Infusions body wash.
Definitely Citrus Splash & Berry Fusion! I am most interested in trying the Strawberry Scrub. I’m MOST interested in trying Heavenly Vanilla, but you make Strawberry Scrub sound heavenly,too! I’m not normally a strawberry person, but your description makes me want to try it. But really, any of them sound lovely. Tought call between Strawberry Scrub and Heavenly Vanilla… But Strawberry Scrub would be first pick. i would love to try the milk protein & honey along with the citrus splash & berry fusion. i love all of their products! has anyone else tried the vineyard escape? smells awesome. thanks for the giveaway! Citrus Splash & Berry Fusion sound really good. I love, love, love, the strawberry scrub ! I really love my Soft Soap Body Washes Loveee the Heavenly Vanilla and with tanning season coming (spray tan) love the scrubs currently the Strawberry but would love to try the Coconut makes you feel like you are on a vacation ! Would like to try the coconut scrub. I would like to try the Strawberry Scrub Body Butter body wash!!! Thanks! I recently discovered that I really like the scent of Shea Butter, so that’s definitely the one I’d like to try. I’d love to try the Sweet Honeysuckle and Orange Peel body wash. I previously tried one in grapefruit and it was marvelous. The body butters must be amazing too!! sweet honeysuckle and orange peel sounds fantasmic. I’d like to try the Heavenly Vanilla and the Shea Butter. I would love to try them all, but my first pick would be the pomegranate and mango. I want to try them all!! Especially the Strawberry Scrub!! I’m most interested in trying out Creamy Milk Protein & Honey. I want to try Strawberry Scrub! Black Orchid, it sounds super exotic! I’d like to try Shea butter…I hope it will help my dry skin! Would love to try the Juicy Pomegranate & Mango Infusions>>>>the smell of the combined fruits would be amazing! umm I’m gonna have to say the Shea Butter …. but I’m eyein’ the strawberry scrub as well! I would like to try the juicy pomegranate and mango infusions. I would love the body butter strawberry scrub.I would love any softsoap. I can already smell that Coconut Scrub and Heavenly Vanilla I would love to try those! Citrus Splash and Berry Fusion. Black Orchid & Velvet Hibiscus body wash is the one I want to try first. I want to try the black orchid & velvet hibiscus for me. The coconut scrub sounds devine! Sweet Honeysuckle and Orange Peel sounds nice! I WOULD love the heavenly vanilla scent. I am most interested in that one! The Citrus Splash & Berry Fusion sounds absolutely edible. Thanks for linking up to my FB Giveaway Wall. I would be most interested in trying the Coconut Scrub as it would smell so great and it is an exfoliating body wash.
I’d like to try the coconut body scrub. I’ve tried the Milk and Honey Body Wash. It’s got a subtle scent that’s not overpowering. Really like it. The Coconut Scrub sounds amazing. Looking forward to try that, but haven’t really seen it in store. I’m most interested in trying the Sweet Honeysuckle and Orange Peel. Strawberry Scrub sounds like it would be my favourite. Juicy Pomegranate & Mango Infusions is my favorite. I have been using it for probably two years now. I would love to try the others but I just keep getting the one I love. I just can’t help it. I like shea butter so I would most like to try the shea butter wash.
Oooohh, the Citrus Splash & Berry Fusion sounds really good!! I would like to try the sweethoney suckle and orange peel. I love anything orange, so invigorating! Coconut scrub would be my choice, thanks for the chance. The heavenly vanilla looks lovely. I’m most interested in the strawberry scrub! cocoanut or strawberry sounds nice. Thanks! Would love to try the Shea Butter. The pomegranate mango is my favourite! I don’t think I could ever stray away! I would Love trying out the Juicy Pomegranate and Mango Peel. Sounds Amazing and bet its Smells 100% more! But they all Look and sound Great. Juicy Pomegranate & Mango Infusions would be my choice. I just bought a brand new Vitamix 7500 at William Somona and am making green smoothies each morning and those two flavors are my favorite to include when i can so a body wash like this would be heavenly!! 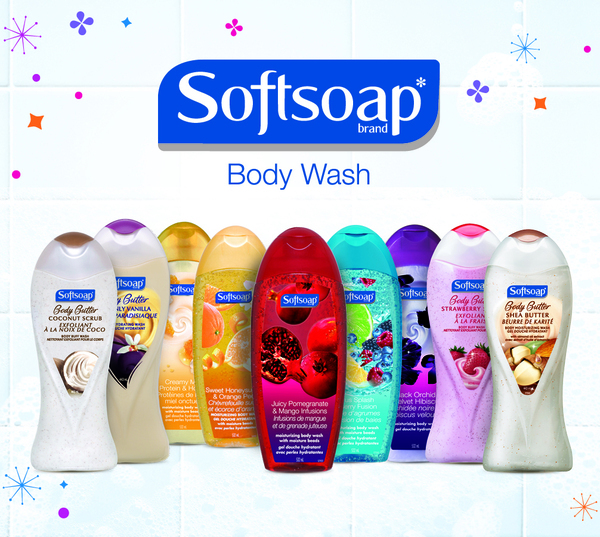 I LOVE Softsoap body wash!!!! !